THERE WERE ALSO TWO MOST WELCOME GUESTS, A TOTAL OF 19 in all. APOLOGIES WERE RECIEVED FROM TWO COMMITTEE MEMBERS AND 20 OTHER MEMBERS. The meeting opened with an address by the chairman, who thanked Ferry Meadows for its help with this meeting and the excellent facilities provided, he went on to thank the visiting Peterborough model engineering group who had provided a track and rides, also the Hastings miniature railway for the provision of the first coal fired diesel hydraulic he had ever seen. He then went on to thank the committee and archivists for their work throughout the year, as well as the unsung heroes who organised shows did the publicity, newsletters and gave general help without who the society would have difficulty existing. He then thanked the members some who had come quite considerable distances to be here, reminding them that this “is your society”. That done he reminded the membership that the society, the newsletter and website are only as good as the articles provided, and that at last year`s meeting there had been quite a number of offers of articles ….Unfortunately we had received only …two! Mention was made of the fact we have 58 working commercial lines within our gauge-range and if members visit, the society would be glad to know of the visit, progress made, locos running extensions and contractions, anything that needs recording for the future or displaying on the web as not all our members are in this country, or capable of reaching some of the lines through distance or illness etc and rely on our newsletter or our web to keep in touch. On the subject of membership our number rose slightly this year to 126 members [given in error as 170 at the meeting] now including a Swedish member with a 12“ gauge line. The chairman went on to say that on the up side some of the commercial loco and stock builders since the society had been promoting the gauge–range have decided to take us more seriously and have begun to produce items for 10 ¼” notably an LBSC 260 by Horley miniature locos and a battery 4w ride on by phoenix engineering to name but two. On the downside there has been an ongoing problem with the website that despite some of the best brains available has caused us a lot of time loss which has led to the archivists not being able to update and give the promised items. The chair is reliably informed that we are now sorted and the first of the changes will soon be on site. Scheduled this year are all singing all dancing wiki`s for the working lines, as well as a list of all the known closed lines so members can send in recollections, or ask for known details. Lastly he touched on the railway of the year competition this year going to a line at the top of our gauge range, Littlehampton railway and how it had been proposed to operate this competition via our face-book next year to include as many voters as we can. It was pointed out that this required an amendment to the constitution this was passed to any other business. The account was accepted by unanimous vote. There followed a short report by our membership sec and web master Mr D Coging who reported that there had been a slight increase in membership to a total of 126 members. He reported that the web problems that had been encountered have now he believed been overcome, and that changes to the web will soon be forthcoming. Mr R Osman then explained along with Mr P Devonport the way the new wiki system will work, this coming on stream we hope before the year`s end. An engraved plaque presented by our society; to the line with the highest votes as being the most memorable or best progressed line visited in 2012. This year the recipient was Littlehampton railway and the plaque was accepted by their MD Mr C Philmoore. Our chairman then reported the progress of our archivists, who it would appear are now in a position to answer a limited number of questions about individual lines, the lines being listed for inclusion in the web page in a few weeks from now this will improve our range of details available greatly. But it was stressed this is very much an ongoing project. There followed a short discussion on the newsletter and its need for photo`s and news it was also mentioned about the magazine that had been investigated by the society committee and had to be shelved on account of lack of input, lack of editor, and shear price to each member. Mr B Palmer asked that we could have visits to lines either private or public. The chair explained that he was trying to get the first few visits sorted at this time and the basic details would come up in any other business. Mr C Stockdale asked if there was any reason that the membership list could not be public and this was answered by the secretary who quoted the data protection act, though we were at liberty to ask the members if they wished to participate. This is to be done by letter along with the request for details of private lines and details of the proposed buddy system of mutual help between members. Mr C Phillimore observed that there seemed to be no suggested standards for track-work etc, and that although there was no way to enforce standards on anyone perhaps a set of guidelines would be appropriate. He further offered to work on this for the society. By our constitution ½ of our committee must be re-elected each year this affords the chance of members putting themselves forward to committee and allows for fresh thinking. This year the four candidates were Mr Ailwood, Mr Coging, Mr Potter and Mr Osman. No other nominations having been received and no objections made these worthies were duly re-elected by a show of hands. Item 1 was the constitution amendment for the financial year period and this was quickly dealt with by unanimous show of hands. Item 2 proposed by Mr D Coging was a further amendment of constitution to allow the membership year to run from the same period as the financial year, seconded by Mr Adams and passed by unanimous show of hands. Item 3 Mr Adams proposed that as discussed earlier the increase of the fees to £14 from the present £10 [AGM 2012] be held over for another year as, as yet we as a society are not fully achieving what we set out to do Seconded by Mr Coging and passed by a unanimous show of hands. 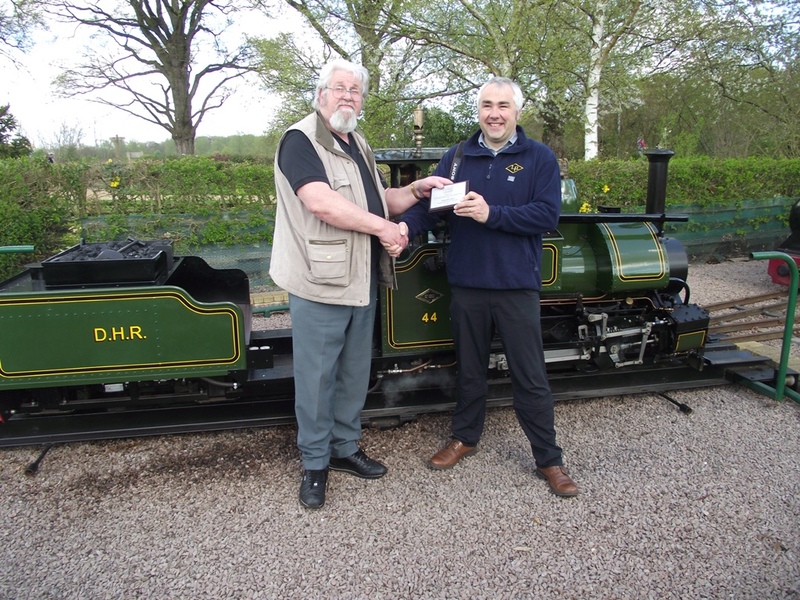 Item 4 Mr C Stockdale introduced himself and asked members for details of working miniature railways, that is lines used for other than passenger purposes, transport of garden materials, logs, animal feed etc as he is working on this as a project. Mr P Devonport in Congratulating him suggested he would like to take on the post of publicity officer for us as he was so well placed, this was decided by a show of hands and carried unanimously to great applause. The next item was the visits, the first is an invite to Stapleford for their open day once again [details are on the web site] a fine day out best not missed. And the third to the open camping weekend at the 10 ¼” line at Maesbury Shropshire in July. Again details will be on the website. Mr Richard Coleby asked if anyone had a scale loco in 10 ¼” that would like to be visiting loco at Stapleford. Opportunities for visitor locos are rare at this line so if you want to offer a loco now`s your chance. The last item of the day is as usual next year`s AGM the chair asked for a central location but the opinion of the floor was that we should have alternate areas alternate years, this idea was accepted and the Littlehampton line then kindly offered to host next year`s event. The meeting closed at 15.10 and there was then a short and most interesting presentation of the history of the Littlehampton line by Chris Phillimore. Followed by rides for all at Ferry Meadows.